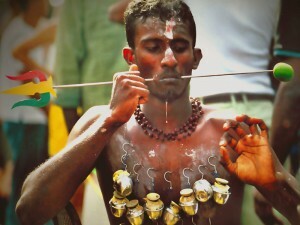 Thaipusam is an important event in the Tamil calendar. It is a very special day for Lord Siva and Lord Muruga and attention is given to the asterism Pusam (Pushya in Sanskrit), the day which usually coincides with the full moon day. The procession takes place in January or February, on the tenth month “Thai” of the Hindu Tamil calendar. It is believed on this day the stars, Pusan and Brihaspati are united into one, the full moon is in transit through the brightest star, Pusam. It is a celebration of the birthday of Lord Subramaniam (also known as Lord Muruga) the youngest son of Lord Shiva. The people are somewhat secretive about the pilgrimage. Although they would politely answer questions, they were good at not telling too much. The participants are actually performing a sacrifice to the Gods, for good luck, health and even material gains. It is up to them to decide if they want to participate and what kind of sacrifice to bring or do. Once the choice is made, they have to live in a monastery, be abstained from all pleasures and fast for two weeks or so. During the procession, friends and relatives cheer them on. In the background there would be repetative musical, shoutings and drummings. The Kavadi is an important aspect in Thaipusam. Unlike India, where the Kavadi procession is more controlled, Singapore and Malaysia are actually more well-known for it. Even devotees from India make a trip to these countries to witness Thaipusam. Each year, thousands of devotees offer their Kavadi to Lord Muruga as their penance and devotion. Kavadi is a Tamil word, meaning suspended in a pole, carried on the shoulder. It is actually a semi-circular structure, decorated with palm leaves, peacock feathers and flowers. It bears the word VEL (symbol of Lord Muruga) and carries two vessels of milk that is offered for ‘abishegam’. By carrying a Kavadi, a devotees is infact carrying items to be offered to Gods, brown sugar, rose water and fruits, just to name a few. Carrying a Kavadi does not mean an act of courage. 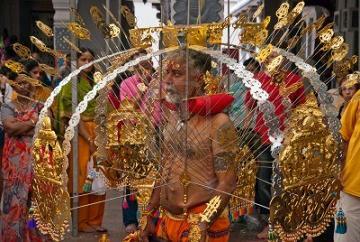 It is not a show-off and it doesn’t matter how many hooks are pierced into the body or how big the Kavadis are. It is actually an act of devotion. The act of placing the Kavadi at Lord Muruga’s feet and pouring the milk as ‘abishegam’, the devotees are actually pouring the love from his heart, he cleanses his mind and soul, seek forgiveness, mercy and love. However, it is almost impossible to imagine a normal human being piercing his own body. The piercings seem to cause no pain, and there is hardly any blood. 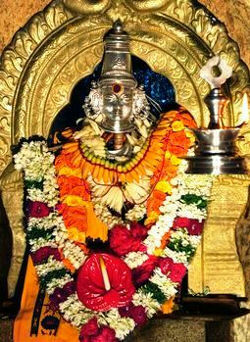 It is said that these devotees are somewhat “possessed” by the spirits who gave them the ability to do the impossible. What do you think? During the Kavadi procession they usually chant VEL VEL or AROHARA. VEL is actually Lord Muruga’s weapon, the Spear. So what does AROHARA means? “Arogam” in Tamil means pure and blissful. Hara(n) is another name for Lord Siva. So AROHARA means Blissful Siva. It is like an emotional cry for the blessings of Lord Siva.